This festive season Amanda Davis-Baird cracked open the champagne weeks before anyone else. And there were many more hugs than usual for her two small boys. But Amanda has a lot to be extremely thankful for. A year ago, she wasn’t sure she’d even see summer, let alone Christmas. The young mother-of-two had received the shocking news that she had pancreatic cancer — one of the most aggressive types of the disease. The first sign that something was wrong came last September when, quite ­suddenly, Amanda lost her appetite. Over the next few weeks, she found herself ­skipping ­breakfast, then lunch, and only managing a few mouthfuls at dinner. So, in October, he referred Amanda for a ­gastroscopy, where a ­camera is inserted down the throat to examine the stomach. But, when the NHS appointment came through, for six weeks away, her husband James, an IT ­manager, insisted on going ­private, especially as, by now, Amanda had ­developed a nagging ache in her left side. The gastroscopy revealed ­nothing wrong. But, with the pain in her side ­worsening, her consultant arranged for an ultrasound scan five days later. ‘I honestly believed everything was fine and insisted James ­continue with a work trip to Dubai,’ says Amanda. ‘But ­ during the scan, the ­radiographer went quiet and stared at the screen intently. At her next appointment, Amanda was due to have a CT (computerised ­tomography) scan. When she and James turned up at the hospital they were told the machine was broken and referred to another nearby hospital. Amanda was given her notes in an envelope to hand to the doctors when she arrived. On the journey there, she read them. Arriving early for the appointment, the couple walked around a nearby park in silence, hand-in-hand, James wiping tears away. They wouldn’t know how bad things were until the results of the scan a few days later. But they decided to be honest with their sons, Cameron and Cullen, then 12 and nine. When Cullen asked, wide-eyed: ‘Is it ­cancer?’ Amanda nodded. ‘The doctors think it might be,’ she replied. ‘Could you die?’ he asked. ‘I told him: “I could. But Mummy is going to do her best to beat this,”’ Amanda recalls. The results confirmed she had a tumour on her pancreas. This gland is located behind the ­stomach; its job is to produce digestive enzymes that break down food, and the hormone ­insulin to control blood sugar levels. About six-inches long, it’s shaped like a thin pear; the wider end is called the head, the middle ­section the body, and the narrow end the tail — which is where Amanda had a tumour. The average life expectancy for those with pancreatic cancer is just four to six months from ­diagnosis. This is partly because the pancreas is situated deep in the body, so by the time cancer is discovered, it’s often too advanced to treat. Patients are often also misdiagnosed; around 80 per cent are already at the terminal stage by the time cancer is confirmed. There are 7,700 cases a year in Britain but just three per cent of these patients will be alive after five years. ‘Pancreatic cancer is a wolf in sheep’s clothing because every early symptom can relate to ­common ailments such as ­dyspepsia, acid indigestion or backache,’ says David Tuveson, professor of pancreatic cancer medicine at the ­University of Cambridge and Cancer Research UK. The disease, which claimed the life of actor Patrick Swayze last year and has also now affected Aretha Franklin, is thought to be on the rise, with the number of cases up by two per cent between 2005 and 2007. Smoking accounts for 20 per cent of cases, but some scientists believe our consumption of fizzy, sweet, soft drinks and rising ­obesity levels are behind the increased incidence. High levels of sugar mean the body has to produce more ­insulin — the theory is this ­contributes to pancreas cancer cell growth. The tragedy is that while ­survival rates for other cancers have improved, the rates for ­pancreatic cancer are as poor as they were 40 years ago. Lack of treatment options, as well as late diagnosis, is largely to blame, says Alex Ford, chief ­executive of Pancreas Cancer UK. ‘There is only one pancreatic ­cancer chemotherapy drug ­formally approved by NICE, which is just pathetic. Amanda was somewhat fortunate that the golf-ball sized tumour had affected the ­neighbouring spleen. This gland helps guard the body against bacterial ­infections; the pancreatic tumour had forced Amanda’s spleen to swell and become painfully engorged. ‘This caused the ­excruciating pain in my side — which was an early sign that something was wrong,’ she explains. But, despite this, her outlook was still grim. ‘If we can’t remove the tumour, we’re looking at about six months,’ her consultant told her gently. He explained that an MRI ­(magnetic resonance imaging) scan would allow him to analyse the tumour in even more detail. Amanda was to have the tail and body of her pancreas removed, which would take about eight hours. Because the blood supply is closely connected to the spleen, that would be removed, too, as a precaution. Without a spleen, Amanda would need innoculations, regular flu jabs and daily penicillin for the immediate future and possibly life. Without a completely functioning pancreas, she would have to take a mixture of digestive enzymes ­normally released by the pancreas, to digest food. There was also a chance of future diabetes. Amanda pushed away her feelings of terror as she waved to her parents and James, and was wheeled off to theatre at 8am on December 2. ­Coming round afterwards, she had just one question. ‘What time is it?’ she croaked. As the answer of 12.20pm filtered through her groggy brain, a horrible realisation dawned. She’d calculated that if the operation had gone well, she wouldn’t be ­coming around until at least 3pm. It was too early. ‘Then another voice said: “It’s ok, Amanda. We got it all out.” The relief was like nothing I’d ever felt before,’ she recalls. Just before Christmas, her ­consultant confirmed the tumour had been ­malignant. In January, she would start six months of ­chemotherapy to blast any ­cancerous cells left behind. On Christmas Eve night, Amanda and James cuddled up in front of a crackling fire. 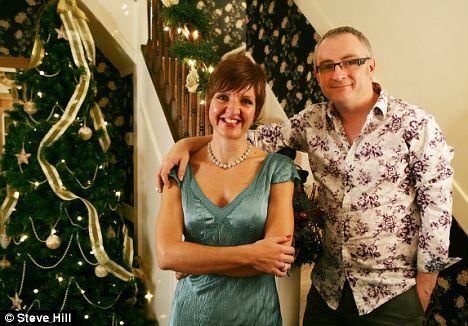 ‘We’ve celebrated Christmas together since we were 14 and had been married, then, for 16 years. I tried not to wonder if he’d be sitting alone on the couch next December,’ she says. 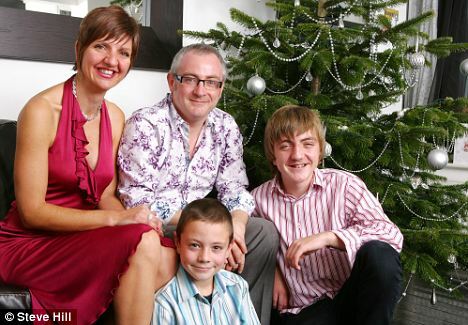 Next morning, the family dressed up in their best clothes, sipped Bucks Fizz over breakfast, and even had their usual Christmas Day country walk — with James pushing Amanda in a tinsel ­covered wheelchair. Early symptoms of pancreatic cancer can include indigestion and abdominal pain, says Dr David Tuveson. Other signs include jaundice, persistent back pain, nausea, stomach ulcer-like pain, intermittent diarrhoea, unexplained weight loss and unexplained blood clots. ‘The symptoms which tend to concern doctors are yellowing of the whites of the eyes, weight loss (due to muscle cell shrinkage as the body tries to nourish itself) and sudden onset of adult diabetes,’ says Dr Tuveson. The six months of chemotherapy, three weeks on, one week off, left her sick, tired, and washed-out. Two weeks after chemotherapy finished, Amanda’s friends entered the 5k Race for Life run. ‘I was feeling a lot better by then so surprised them by turning up with trainers after entering in secret,’ she says proudly. She ran the entire distance. James and Amanda went to see her ­consultant for the results in August. And, to their delight, she was declared ­‘disease free’. She explains: ‘Doctors only ever give an official all-clear five years after diagnosis. But, for now, there is no physical sign of cancer. ‘Luckily, my cancer was discovered early enough to treat. ‘We were also fortunate in having medical insurance through James’ work. By the time of my first NHS test, I’d already undergone ­surgery. The NHS is brilliant — but if I’d been relying on it I wouldn’t be here now. Today, Amanda feels back to her old self, although she still gets tired easily. ‘There’s a 50/50 chance of my cancer returning but I’ve defied the odds so far. ‘Holding a candle at our local Christmas carol service this year, I said a silent thank you for the best present ever — life.